Northeast end of Arrowsic Island, on the Kennebec River. Private residence. Best to view from one of the boat tours out of Boothbay Harbor. 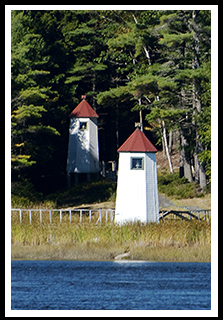 The Kennebec River Range Lights, or Doubling Point Range Lights as they are referred to, were established on Arrowsic island to mark an extreme double turn in the channel at what is known as Fiddler Reach. It is the only range light in Maine with two towers with identical lights. A ship's captain would know that when the two light towers are aligned they are in the middle of the channel to make sure they were still on course. On December 28, 1928 Keeper Captain Harry L. Nye made a rare rescue of four young men caught on a large ice floe that had broken away and was carrying them down the swift current of the Kennebec River out to sea. He made it out in time to reach them and bring them to safety. In 1938, Lucy Mae Woodward, the young daughter of Keeper William H. Woodward, fell in the river near the keeper’s house and drowned despite frantic attempts to revive her by the local police and neighbors. Many believed that she might have suffered a slight heart attack that caused her to fall. In 1990, the range lights became one of the last light stations in the United States to be automated and are still used as navigational aids at a private residence that also tenders Doubling Point Light and Squirrel Point Light. Historic Bath provides lots of specialty shops and galleries for visitors to explore. Visit the Maine Maritime Museum to explore and take in one their many types of lighthouse cruises and nature excursions. After crossing the huge Kennebec River Bridge in Bath, travel down 127 and you’ll find Doubling Point road and can ask permission to explore the Doubling Point Lighthouse, and the Doubling Point Range Lights across the street. Wiscasset is on the way to the Boothbay Harbor region inviting many artists and writers. It has been commonly referred to as Maine's prettiest village. 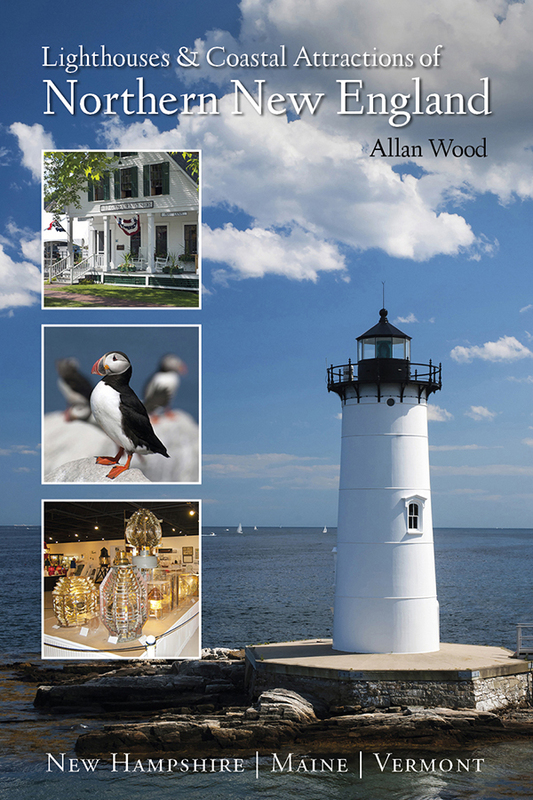 In Wiscasset, visitors will find an abundance of antique shops, galleries, and museums. The Wiscasset, Waterville & Farmington Railway Museum is an operating, two-foot gauge steam railroad. Then bear left at the fork to reach Doubling Point Range Lights; if you bear right at the fork you will come upon the Doubling Point lighthouse. The people who live at this residence maintain both properties and Squirrel Point Light. Boat cruises mentioned below offer many types of cruises. 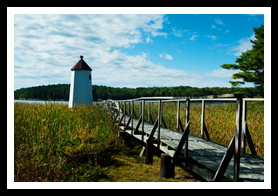 During specific lighthouse cruises, they may pass by Kennebec River (Doubling Point Range) Lights. They may also pass the lighthouse as part of charters, narrated wildlife and historic tours, whale watching, fishing tours and other types of excursions. You can charter this pontoon boat for lighthouse, fishing, and wildlife excursions.